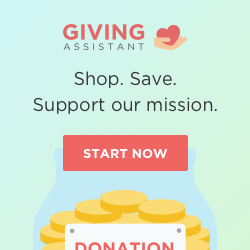 You can support our life-affirming ministry every time you shop via Giving Assistant. Every purchase you make at any one of Giving Assistant’s 3,000+ popular online retailers can be transformed into a meaningful donation to Pregnancy Center West. Giving Assistant shoppers earn an average of $700 cash back on their purchases every year. Then, they donate a portion of their earnings to organizations they value. Sign up today to unlock great deals like exclusive Old Navy coupons, as well as free donation opportunities at retailers like Bed Bath & Beyond, JC Penney, and Aliexpress!